Alabama School Connection » Standardized Testing Time Is Here – Why Do We Bother With Testing Anyway? My children’s introduction to standardized testing was in the spring of 2002. I recall being asked by my youngsters why they had to take “those” (standardized) tests in elementary school. They didn’t receive any grades for the tests, so what was the point? I explained that it was important to measure how much they had learned and where they stood competitively with other children across the state and across the country. Being of a competitive nature, they smiled and proceeded to perform their best on those tests. It was then that I began my inquisition into the nature and importance of standardized testing. It was then that I learned that leadership within the district cared little about how our children’s achievement results compared to other school systems across the state or across the country. Alabama’s third through eighth graders began the annual ritual of standardized testing this week. Schools are given a seven-school-days window, from May 6 to May 14, to administer the Alabama Reading and Math Test (ARMT+) to our children. As the name indicates, students are tested in reading and math. Students in 5th and 7th grade are tested in science as well. Students receive no grade for the ARMT. So how do you get them to perform their best? And does one week of testing really show a valid level of student achievement? My answer to both of those questions is “I don’t know“. But what I do know is that the ARMT forms the basis for Adequate Yearly Progress (AYP), which forms the basis for whether schools are seen as successful. Or not. Click here to read the ALSDE’s explanation of Alabama’s accountability system under No Child Left Behind (NCLB). 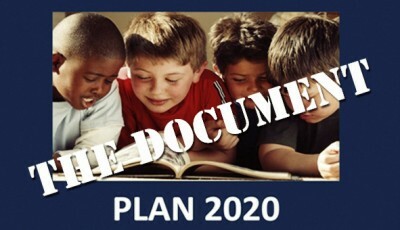 Note: yes, State Superintendent Dr. Tommy Bice and the State Board of Education are working to implement Plan 2020, but the accountability portion of the Plan won’t be operational for a few more years. And no, still no word on Alabama’s ESEA Flexibility Waiver request submitted last September. For now, we still have ARMT and AYP. Do You Know What Your Child’s School’s ARMT Results Are? Often, we only look at the media reports about whether our child’s school or school system “made AYP”. Far too often we have no idea how our child’s school fared or how the other schools in our system performed on these tests. If I asked you what percentage of the children in your child’s grade exceeded proficiency standards in math, would you be able to answer? Does it make any difference to you? What would you do if you did know? What if the results weren’t what you expected them to be? Would you ask the principal or the teachers at your school why achievement wasn’t as high as you thought it should be? Would you talk with school board members about your concerns? Would you start the conversation with your PTA or PTO leaders? Cause that was the whole point of requiring these tests in the first place. To start the conversation where it needed to be started. 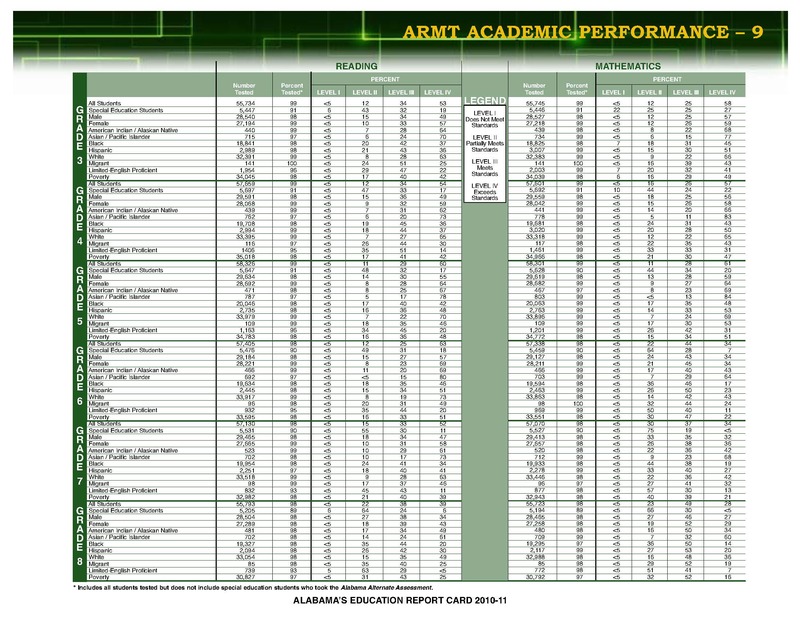 You can find your child’s school’s and system’s ARMT results on the ALSDE web site. When you choose gender, special education, general education, ethnicities, and/or “special groups”, you will see the results broken down by “subgroup”. The idea behind this was to reveal how all children are performing on standardized tests, not just those in the majority. In my opinion, the subgroup disaggregation requirement was the best thing about NCLB. While this is a nice tool for a quick snapshot, it doesn’t show trends in achievement. Sure, you can select other schools in your district to see how the children in other schools in your district are performing. You can also look at the system as a whole. But the whole exercise in data-excavation is fairly cumbersome and time-consuming. PARCA has created an incredibly rich database allowing comparisons of multiple years and multiple subgroups of children. They offer multiple tools in multiple ways to allow you to view comparisons. Before you use their comparisons, you must take a few minutes to understand the color-coding system. 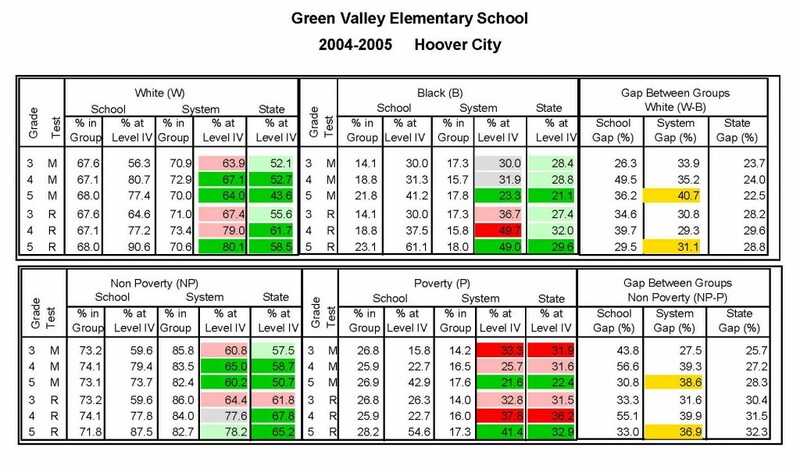 The colors present a visual comparison of how children in that grade, subject and subgroup are performing in comparison to other children in their subgroup, in their school system, and across the state. Basically, dark green is great, green is good, light red is bad, and dark red is really bad. Gray is neutral. This particular tool is great for determining how the school results have changed over the years. Here’s my neighborhood elementary school in the 2004-2005 school year. 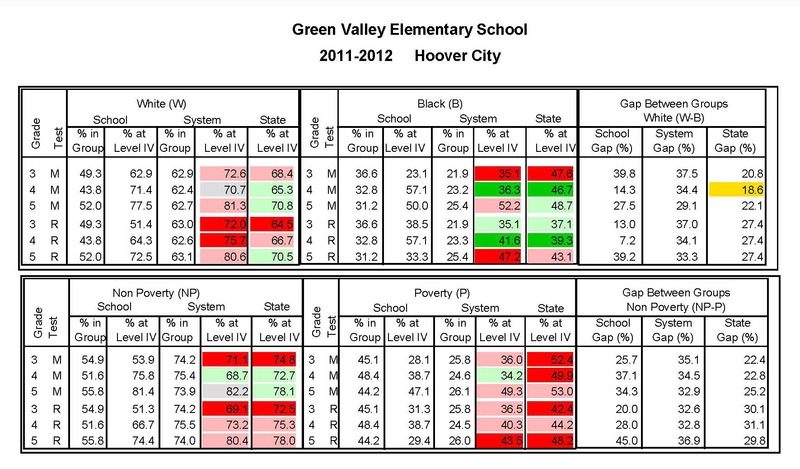 And here are the results for the 2011-2012 school year. Do you see how there are more red cells in last year’s data compared to the data from 2004-2005? These results beg for conversation to begin with school and district leaders. I encourage you to use PARCA’s tool to look at ARMT results for your child’s school over time. See what the trend is. Are there more green cells? More red? Has the ratio of green and red cells changed over time? If so, how? 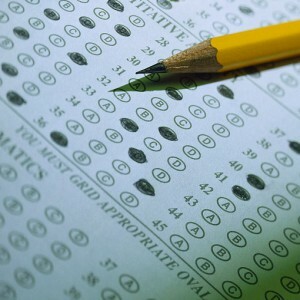 Do Test Scores Matter? And If So, To Whom? I was under the apparently false assumption that standardized test scores actually meant something to educators and school leaders and that’s why we put our children through this exercise every spring. What I have come to believe is that too many educators do not take test score results seriously. Annual school-wide standardized test results are seen as misleading and shouldn’t be trusted. 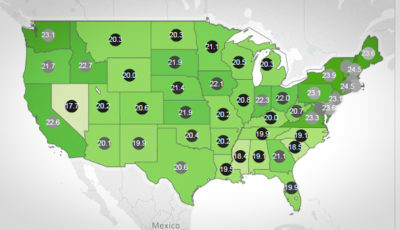 For many educators, as long as they “make AYP”, which means scoring higher than the necessary cut score, they breathe easy for another year, until the next spring arrives, when some perhaps worry about whether their efforts are good enough to keep their school off of the Didn’t Make AYP List. Principals usually take standardized test scores a little more seriously, as they have to answer to district administrators if their school fails to make AYP, though I have yet to see evidence of serious consequences for any principal whose school continually fails to make AYP. Superintendents appear to be generally concerned with the additional costs involved when school improvement plans are complicated by spending two years in a row on the Didn’t Make AYP List. School board members minimize standardized test results at all costs. Especially when results are not good. Recognizing the valid limitations to annual standardized tests, these results are still one indicator (and currently the only indicator) of the overall achievement level of the students at the school. And if neither teachers, principals, nor district leaders use test scores as even the simplest red-flag indicators, what’s the point? Why do we put our children and our teachers through the agony of annual testing? Before you completely give up on these tests, you should ask your teacher if test results are used for student placement in any advanced or enrichment classes. If so, then you should be sure to encourage your child to give these tests their best efforts. If not, you will want to ask what annual test results are used for, if anything. You may have noticed the news coverage of parents who are opting to keep their children out of participating in “high-stakes” testing. In response, one district went so far as to forbid students from participating in sports the following year if they failed to participate in standardized tests, while simultaneously providing incentives like earning one raffle ticket for every test taken. No way to tell if this movement will continue to gain ground, but I suppose we need to keep an eye on it here in Alabama. One point to make about opting-out is that if participation levels fall below 95% for a subgroup of students in a school or aggregated as a system, that could result in a school and/or system not making AYP. If you are considering keeping your child home during the ARMT, I encourage you to talk with your child’s teachers and principal to explore your concerns. The annual standardized testing requirement made its debut in 1995 in a large education reform package passed in the Alabama state legislature. Act 1995-313 mandated annual achievement testing for grades three through eleven. 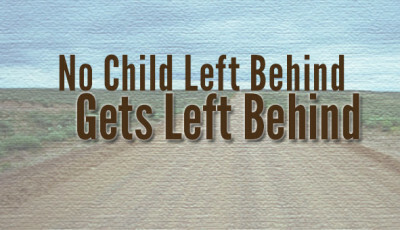 The Act appears to have been mostly supplanted by NCLB through a resolution of the State Board of Education, though I cannot determine why all of the provisions under Act 1995-313 were abandoned once NCLB came to be, especially since some of the accountability provisions were stronger than ones that the ALSDE outlined in its NCLB plan filed with the U.S. Department of Education. And the accountability reporting section still remains in the Code of Alabama, even though requirements for student achievement reporting are not followed. So Alabama had already embraced the idea of using an annual standardized achievement test prior to the passage of NCLB. The stakes were a bit different, and no lists of failing schools were produced. We used the Stanford Achievement Test until NCLB mandated that officials develop a test aligned to our state standards. That’s when the ARMT was born. 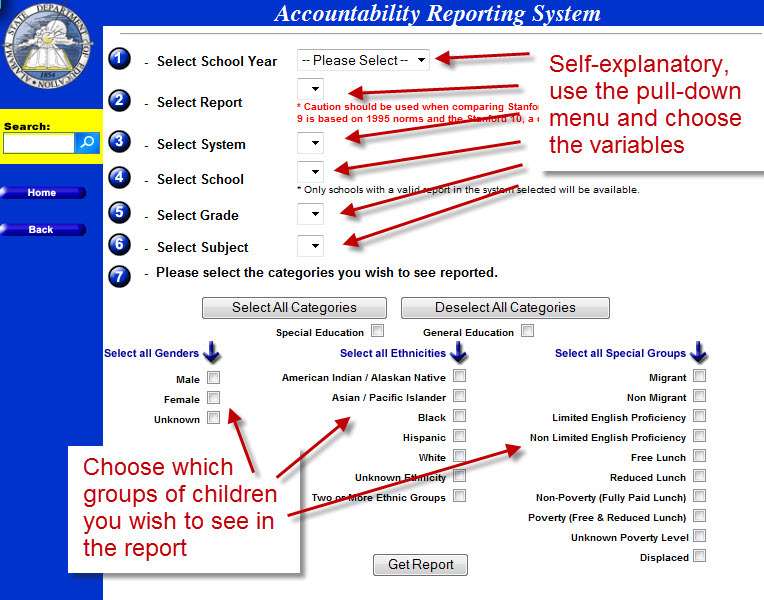 Part of what that 1995 law required and what NCLB still requires is the production of the annual School Report Card. The whole idea behind sharing this information with the public was to allow the public, including parents and families, to utilize the Report Card to ask the tough questions and push for improvement in student achievement in their neighborhood school. 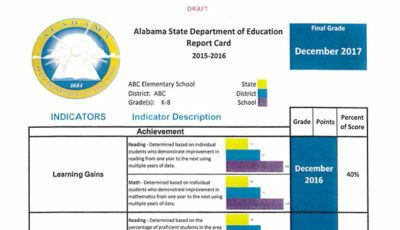 The ALSDE has not produced any school-level report cards since the 2008-2009 school year which, in my opinion, violates the spirit, if not the letter of the law. Instead of school-level report cards, the ALSDE has chosen to produce one statewide report card and incorporate this statement: “To meet these requirements, the Alabama Department of Education incorporates the NCLB State Report Card in the Alabama’s Education Report Card, which provides statewide information incorporating all NCLB conditions.” Yeah, right. And a parent in a rural school system is going to glean the information she needs to know about her child’s school from the 28 pages incorporating 132 school systems’ information. Here’s the page on statewide academic performance. Easy to follow, right? Check out how Texas presents their NCLB report cards. What a shame our own ALSDE won’t produce the school-level information we need to help our community schools improve. (One is forced to wonder if this is why the Alabama legislature seems so interested in dictating accountability to the State Board of Education.) And no, that Legislative Grading system passed last year isn’t expected to be fully operational for a number of years due to the proposed changes in assessments and the need to get baseline measurements to fairly assess success and growth in achievement. So if we’re going to bother to test students every year, we ought to at least know what the results of those tests are. And unfortunately, it’s up to us to dig out the information and determine achievement levels in our neighborhood schools. The PARCA tools are more helpful than what the ALSDE offers, but it is still up to us to use the information we find to help our neighborhood schools improve student achievement, which was the whole point of mandating standardized testing in the first place. If you have any questions about how to understand test results, please post your question here or on the facebook page.